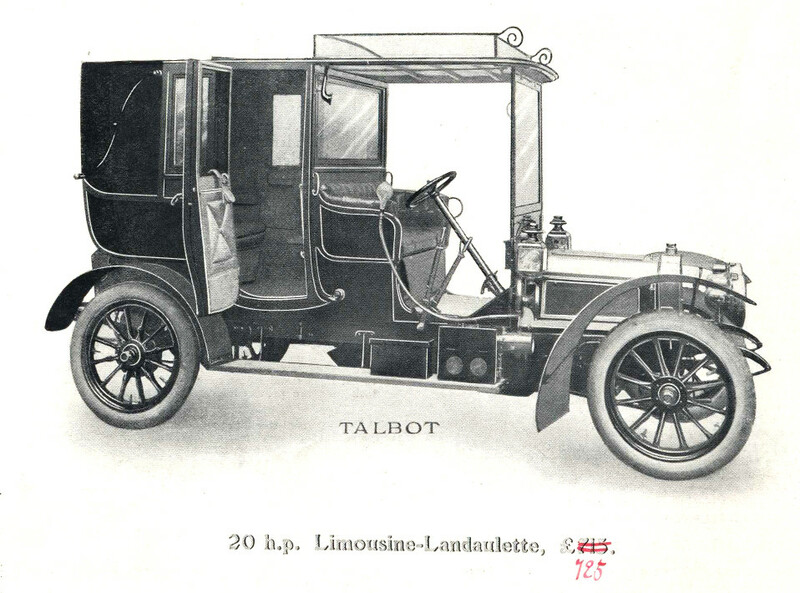 Clement Talbot, founded in 1903, brought together the engineering genius of French automotive pioneer Adolphe Clement and the money and social standing of English aristocrat, the Earl of Shrewsbury and Talbot. Initially the cars were imported from France and comprised two and four cylinder models of varying capacities. By 1906 British content was substantial and from 1908 all models were designed and built at Barlby Road, North Kensington. Thereafter production proceeded with four and six cylinder models. Cylinders were cast in blocks of two and mounted on a common crankcase. Wheelbases varied in length from 8’2” to over 11’. The mechanical specification was orthodox for the period – side valves, magneto, single carburettor, four speed gearbox with cone clutch and rear wheel only brakes. 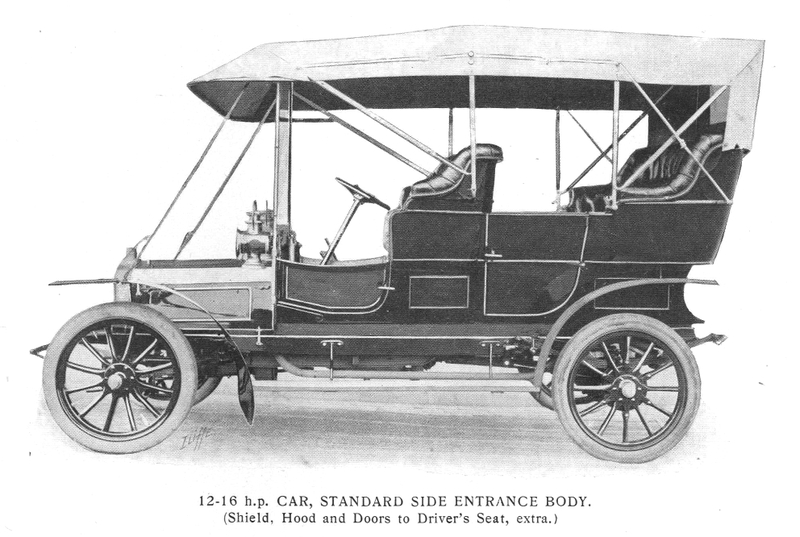 There was a variety of factory-specified bodies and cars were also sold in chassis form for bespoke coachwork. Lord Shrewsbury had interests in coachbuilder J. Rothschild pere et fils, hence many cars we so clothed. 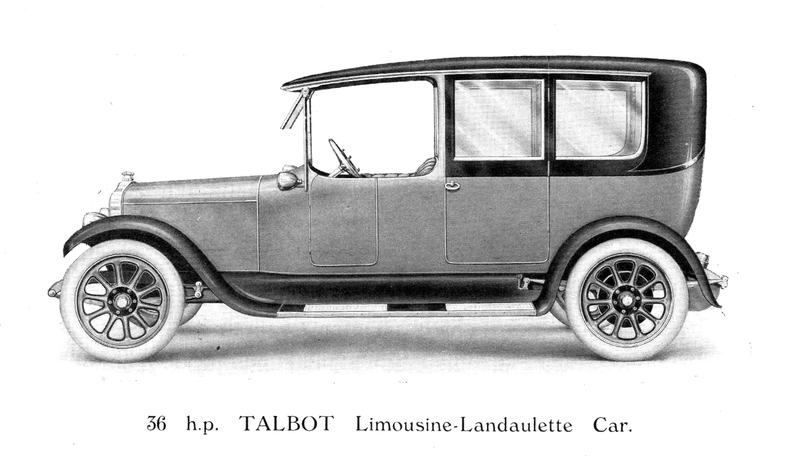 Talbots were popular in competition. As early as 1906 The Autocar described their performance at the Frome hill climb as ‘Invincible’ and the name stuck. 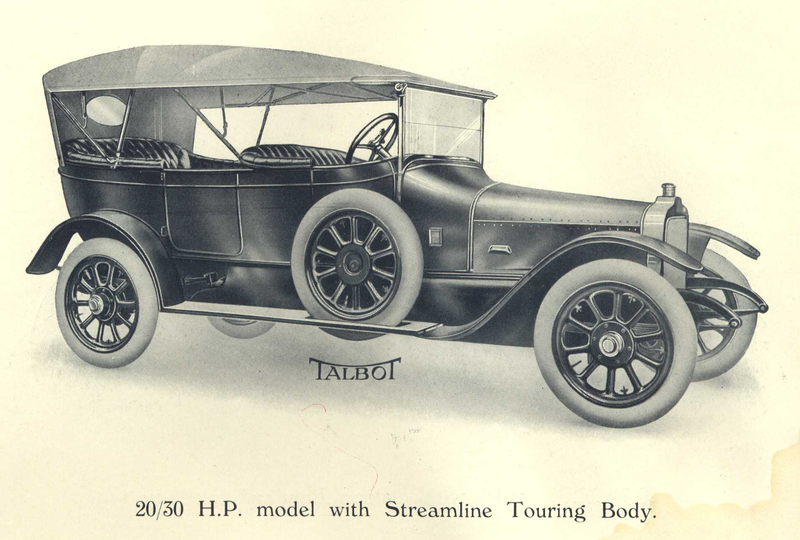 In 1908 a Talbot became the first car to cross Australia. In 1910 a new 101.5 x 140 mm 25 hp engine was introduced with the valves on the same side (L head). 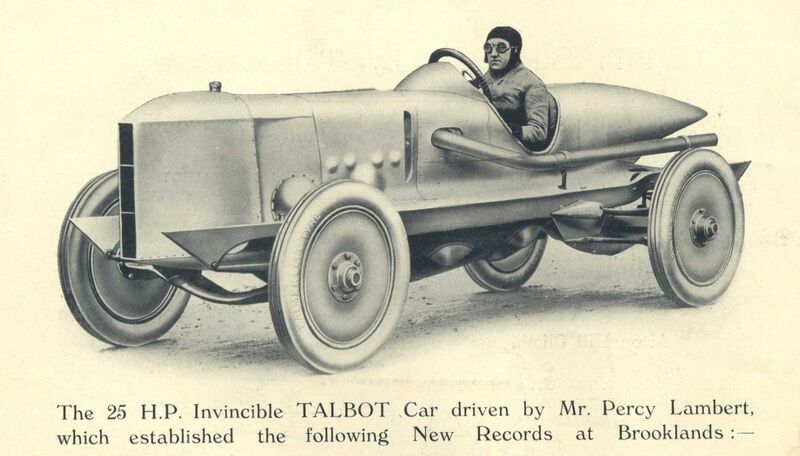 Three years later a modified 25hp engine made history at Brooklands when a single-seat Talbot racer, driven by Percy Lambert, became the first car to cover 100 miles in one hour. The factory team of 12, 15 and 25hp models dominated British speed hill climbs in 1913 and 1914 and were still competitive, in the hands of Malcolm Campbell and Tony Vandervell, until 1923. During the First World War the 15 and 25 hp models were the mainstay of the military, doing sterling work as staff cars, pick-up trucks and ambulances. A third of all the cars produced went for war use. After hostilities the models were re-introduced but the days of the carriage trade were over. The economy went into deep recession and customers wanted light cars. Only the 25hp made any headway – its lusty engine and sturdy wartime chassis making it popular as a delivery-vehicle or charabanc. 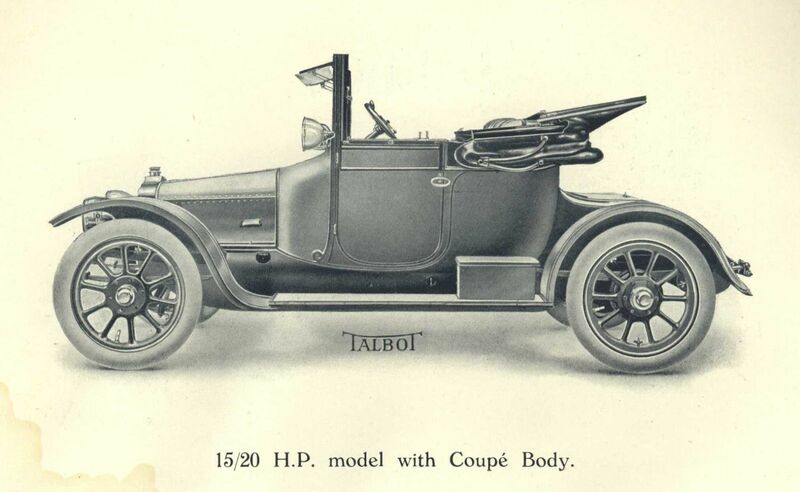 From 1922 Clement Talbot switched to light car production and soon after the great Edwardian ‘Invincible’ Talbots were no more. Survival rates of these cars are low – no more than 50 are known. They are much sought after and regarded amongst the best of their era.